EquaGel Straight Comfort Cushion Purple Medical EQSC1816, EQSC1818 EquaGel comfort cushion for chairs, EquaGel for seats. Best seat wheelchair cushions. A comfortable wheelchair cushion provides the support needed to comfort the lower back area. It can also align the spine and provide the support needed for prolonged usage. The EquaGel Straight Comfort Cushion is able to do both. The EquaGel is made of a dry-polymer gel that compresses and "buckles" as more weight is added to the gel. EquaGel's "column buckling" changes the way the pad reacts under certain weights. Each column of the pad compresses as weight is added, causing the "buckling" effect; however, the rest of the pad expands in order to add support to the surrounding walls. Each expanded column will offer the extra support needed until the pressure is equalized throughout the cushion. 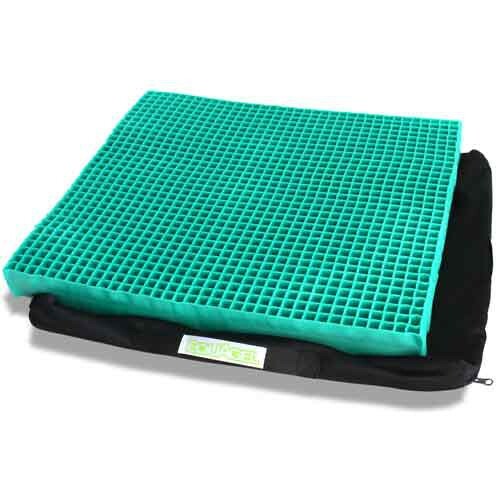 The Straight Comfort Cushion is made for Basic Pressure Therapy and has two layers of protection. The initial layer is a thin, tight grid that serves as the comfort layer. The bottom layer is thicker, helping to provide you with support by cushioning itself around the bottom for posture support. The EquaGel Straight Comfort Cushion comes with a fluid and flame resistant cover. The cover is also vapor permeable, protecting the walls against eventual mold and mildew.